The splendid open cluster IC 2602 was discovered by Nicholas Louis de Lacaille on March 3, 1752 from South Africa, and cataloged as Lacaille II.9. 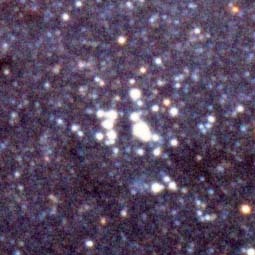 Already Lacaille has compared this cluster with the Pleiades, and it is still known under the common name "Southern Pleiades." The distance of IC 2602 has been slightly adjusted from the data of the Hipparcos satellite; according to these data, the cluster is at 479 light years (the older value had been 489 light years). The image in this page was obtained by Till Credner and Sven Kohle of the University of Bonn, Germany when evaluating their Constellations Crux, Musca, and Carina photography. It was cropped and magnified from a wide-field photograph (27x39 deg) obtained on June 8, 1994, 23:54 LT by Sven Kohle on Cerro Tololo Observatory, Chile with a 50mm f/4.0 lens on Scotchchrome 400 film. In the Astronomical League's Southern Sky Binocular Club list.